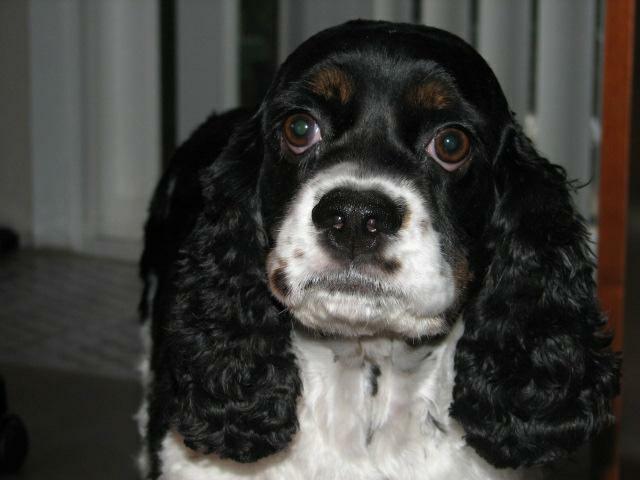 In mid April my English Cocker Spaniel began this long journey with steroids, antibiotics and pepcid along with "keeping still and calm" otherwise she could bleed to death with her "condition" of VERY low blood platelets. We still don't know how this all came about and it has been a horrendous four and a half months trying to be careful with our "little girl". Yes, we treat her like part of the family because she is part of the family. Following is her picture story. This picture was taken right when she first got sick with low blood platelets. It was right after the grooming appointment that she bled pure blood in her urine. We rushed her to the vet and they started her on steroids and antibiotics. Mom, what's wrong with me? Shadow started getting irritable and we just understood that it was because of the badly needed drugs. Oh, my goodness. Now that I'm looking at this picture she really was pretty bad, huh? Mom, Dad! These steroids are making my mouth all dry, my heart beat fast, I'm always hungry. thirsty and makes me hot! Guys, quit laughing at me! Shadow has gone through ups and downs and we have taken her for blood tests faithfully every two weeks and now three weeks. At one point she was being weaned off the steroids but come to find out it was too fast and they had to increase it again. She is now on 1/2 pill a day and finally we got the okay to get her groomed. That was the beginning of August. We couldn't get an appointment until this past Monday the 27th. MOM! DAD! I need a haircut! I'm all fuzzy and hot and ....and I'm fat! We had to put her on a special diet dog food too! Shadow finally had her groomer's appointment this past Monday. After four and a half months the groomer wanted to make sure Shadow remembered her and also to see how she would react to her. The groomer stooped down and so did I. Shadow walked up to her, sniffed....turned around and hopped up and wrapped her arms around my neck! She knew. It was grooming time but didn't want mom to leave her! Aw, Geez MOM! Why do you have to show all your friends on Active Rain my new haircut? Huh? Since her grooming appointment on Monday she is like her old self again! She was chasing her red dot light again, chasing her babies that Gary was throwing. Grring at her babies, prancing, hopping, skipping and yes jumping! It astounded both of us! In the past few months, she gained 8 pounds, was a nervous wreck on the high dosage off and on with the steroids, didn't play with her babies all those months and just was not happy. She loves us right back. Labor Day in Hawaii: Ethnicities and Festivities! Survival of the Fittest Realtors®! Hawaii Residents Are Leaning Towards "Green"
*LAST UPDATE* Hawaii: Hurricane Flossie, Earthquake, Wildfire and..